A Black Friday extravaganza is going down at Allagash this holiday season, kicking off at 10am on Friday, November 27. Bottles of Midnight Brett and James & Julie will both be available, alongside live music, free coffee and donuts, special beers on tap and more. Shopping is for the birds, go drink some beer. Bottle limits and pricing are TBA. James and Julie: our take on a Flemish Sour Brown and offers an aroma of raisins, figs, cherries, and caramelized sugar. Mahogany in color, this medium bodied ale finishes with a clean acidity and a hint of spice. We brew this sour brown ale with Pilsner, Special B, Maize, and Chocolate Malt and ferment it with our house yeast strain. It then ages for two years on stainless steel with our own blend of Lactobacillus and Pediococcus cultures. Midnight Brett: This beer gets its name from the Midnight Wheat we brew it with. The dark wheat gives it a deep, dark chocolate color. The aroma opens with fresh berries and sour cherries, and ends with a warm roastiness. Each sip offers smooth drinkability met with the zip of tart fruitiness on the palate. We brew this beer with 2-row, Midnight wheat, raw wheat, and rye malt. It’s hopped with a blend of Perle, Glacier, and Simcoe hops. We then add our house strain of local, wild Brettanomyces yeast. The yeast works its magic over the next eight months where the beer ferments in a stainless tank. Midnight Brett begs to be shared no matter the hour on the clock. Allagash Brewing Company is located at 50 Industrial Way in Portland, ME. Free coffee, donuts and a limited wild ale release – yup, I’m sold. 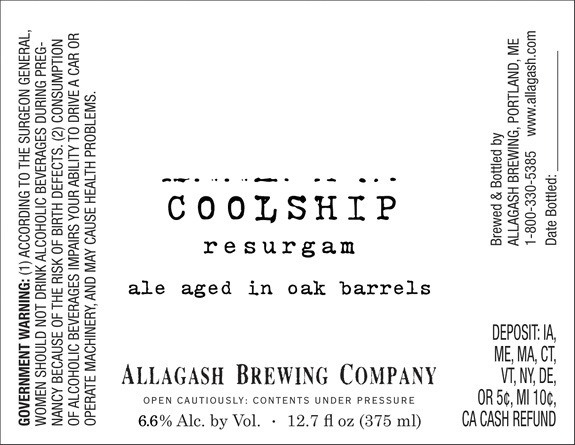 Allagash Nancy returns to the brewery on Saturday, November 14 at 9:30am, so start setting those alarm clocks. This is a sour red ale fermented with 6,000 pounds of cherries harvested from Maine’s own Doles Orchard. 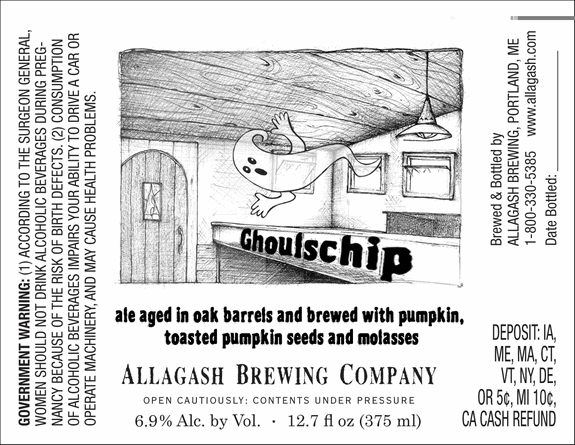 Your favorite spooky wild ale is back again for 2015, as Allagash is ready to drop a fresh batch of Ghoulschip on Saturday, October 24 at 4pm. Haunted House, a seasonal spin on their brewery-only House Beer will also be available in 4-packs of 12oz bottles. 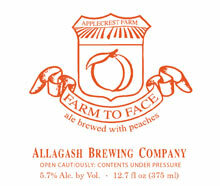 Allagash Farm to Face is set to return this summer, dropping at the brewery on Saturday, August 22 at 9:30am. This is an ale fermented with 6,000 pounds of fresh local peaches for nearly one year, finishing at 5.7% ABV. Don’t forget the free coffee and donuts! The 2nd annual Allagash Wild Beer Round Up is next on tap for the Maine scene, featuring Emotional Honey alongside a trio of familiar faces (Tiarna, Old HLT and FV13). Fun kicks off at 9am on Saturday, January 24 with games, food, prizes and more. 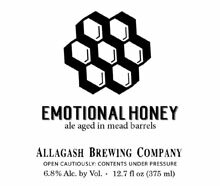 Emotional Honey is a sour red ale aged in an oak foudre for 2 years, then finished in mead barrels for another 8 months, weighing in at 6.8% ABV. Allagash emptied out one of their oak foudres recently, unleashing a sour red ale dubbed Pick Your Own, releasing on Saturday, December 13 at 10am. After aging for 2 years in oak, the brewers added local raspberries, cherries, strawberries and blueberries, then allowed the beer to rest another 3 months in barrels.